PRODUCT FEATURES:All modes automatically default to 200 mA charge;Charge both AA and AAA rechargeable batteries simultaneously;Overheat detection to protect over-charging. The best charger I have ever used!!! The charger seems to work great. Especially great to see it refreshing batteries to optimal capacity. I bought the BC-900 just over a month ago to replace my hobby grade charger. It has been of the best and easiest to use charger. Each battery cell gets a own charge. So when one of them is done, the rest still keep charging until they are done too. Some of the features are over-heat procetion, negative delta peak detection (peak charger or smart charging), Cycle mode (discharges battery then recharges), Charge, Test mode (charges, then discharges, and re-charges again), and Refresh mode (cycle charges the battery many times). Over specs I've seen while charging. It discharges battery cells to .9V before charging. Can only charge up to 3700 mah before it stops (gives room for when more MAH capicity come in the future and a over-charge protection). Charges both Ni-Cad and Ni-MH batteries. 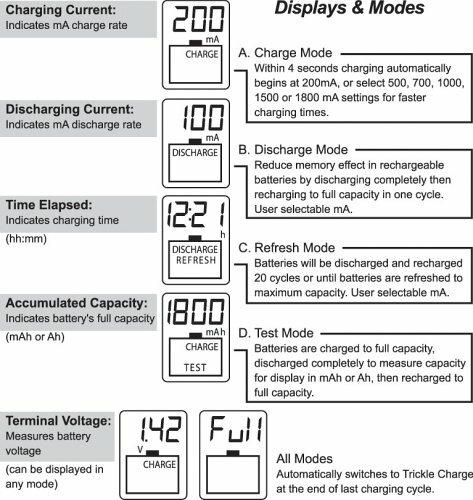 When discharging, the charger uses a 2:1 method. So a 500ma charge will discharge at 250ma. 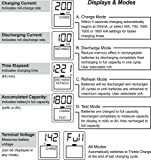 When setting for a discharge, set the current at half of the willing charge rate. La Crosse the only charger you need. The La Crosse BC-9009 AlphaPower Battery Charger Is the only charger you will need for AA & AAA rechargeable batteries, it works with any combination of the two types of batteries and charges as slow or as fast as you want within limits. You can charge each battery in the charger at different charge rates. I bought this charger based on the many good reviews but I think in the end I expected too much from the device and was a little disappointed in the end. I won't waste time writing about all the good aspects, others have done this quite well in their reviews. 1.) It claims 4 independent charging compartments but how can something be independent if the current for all other compartments depend on the value chosen for the first inserted battery? Charging independence is implemented much better on the Maha C9000. 2.) The battery is inserted a bit tight, this is good for electrical contact but not so good when you have to remove the battery from the charger. If you pull out the batteries wrongly, you could end up damaging the plastic casing on them. On the comparative side, this mechanism is a little worse on the Maha C9000 because it actually scrapes the -ve end of the battery and could rip off part of the plastic casing around the battery. 3.) The C and D adapters look and feel cheap. I don't expect much from those. 4.) For some reason it needed to charge batteries for 12 hours that it previously reported as full after already charging them for a few hours. Basically I put in the 4AA that came with the charger and after a few hours they were all full. I unplugged the charger to use the socket for another device and also took out the batteries from the charger. I placed them back to properly top off after a couple hours but for some reason the BC-900 charged the same supposedly full batteries for 12 hours. This never happens on any of my Maha chargers so it makes me wonder how intelligent the BC-900 really is??? Usually if I put in fully charged batteries in either of my Maha chargers, they would charge on the regular charge mode for a few mins then top up charging kicks in. I've killed a number of AA rechargeables with time and use. I was skeptical that anything would really be able to restore them, but this charger is doing the trick.